Formation of the XFree86 Project, Inc. The developers of XFree86, a free-software package developed and distributed via the world-wide Internet, announce the formation of The XFree86 Project, Inc. This article describes some simple techniques for making the best use of the disk storage you have now. 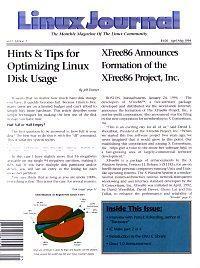 In this issue we interview Patrick Volkerding, the author of “Slackware”, one of the most popular Linux distributions.